Celtic Park is the name of Glasgow Celtic’s legendary Football ground which first opened in 1892. 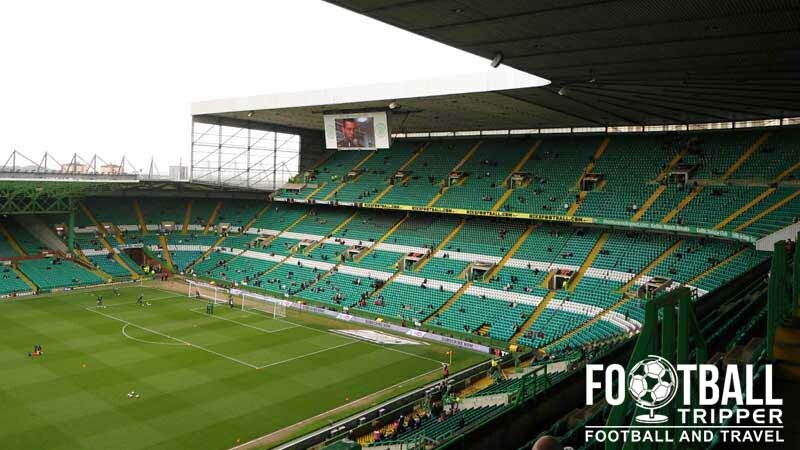 With a capacity exceeding 60,000 it is the largest stadium in the Scottish Premier League and exceeds old firm rival Rangers’ Ibrox Stadium in size by at least 10,000 seats. Today Celtic Park is the largest stadium in Scotland and sixth largest in the United Kingdom but it hasn’t always been that way. The club developed their ground over the course of more than a century since making the site on Parkhead their permanent home one year after forming in 1887. In 1892 The Hoops moved to a different patch of land but after escalating rent prices they opted to move back to their home one season after leaving, and the rest is history as they say. Upon returning to the familiar Celtic Park with newly renovated facilities on the 20th August 1982 a local journalist is reported as comparing the move “leaving the graveyard to enter paradise”, with the nickname of “Paradise” being used ever since by supporters of the club when referring to their home ground. With the new stadium consisting of enough terrace space for 40,000 supporters many fans considered it to be on par with Everton’s Goodison Park which was regarded as the premier stadium of its day. The 20th century saw incremental improvements and the stadium’s capacity being reduced by the Safety of Sports Grounds Act 1975. The club countered this by expanding the number of places to 67,000 which saw Celtic Park eclipse the total size of their Old Firm rivals ground, Ibrox Stadium albeit with terracing. Rangers in contrast opted to convert to all-seating in the 1970s and after the publication of the Taylor Report, their rival’s gamble appeared to pay off with Celtic encountering large conversion costs. The debt accumulated and subsequent takeover benefited the club massively in the long run with the new owner Fergus McCann opting to completely rebuild Celtic Park. With the Taylor Report setting a deadline of 1994 for all football stadiums to be converted to seating Celtic opting to play at Hampden Park during the 1994-1995 season whilst formulating their plans for the rebuilt stadium across three stages: Phase 1 was the rebuilding of the North Stand, Phase 2 was the East Stand and phase three was the South stand and filling in the corners. 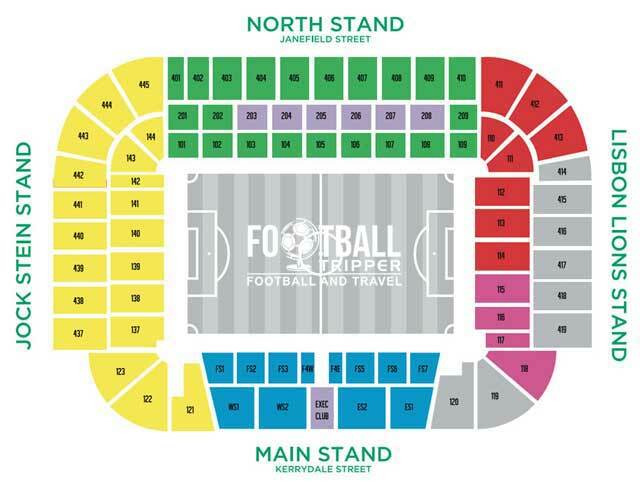 Celtic Park is comprised of four stands: North, East, South and West. Away fans are housed within the lower section of the southernmost corner, next to the traditional main stand. For away fans it is probably advisable to drink within the city centre before catching the train as the pubs such as The Real McCoy, The Oak Bar and Old Black Bull within five minutes of Celtic Park are all unanimously reserved for home supporters. One of the most popular places where home fans can drink before the match is undoubtedly at Kerrydale Bar located at Celtic Park itself. Open to all fans with a matchday ticket, this is easily the best place to soak up the atmosphere before kick-off with pints of Tennents, Guiness, Caledonia Best and Magners available on tap for around £4.00 each. Needless to say the city centre is chock-a-bloc with dining options, with The Forge Shopping Centre five minutes north of Celtic Park also offering a few options including the omnipresent McDonalds, Subway and Greggs plus a few coffee shops for good measure. Within the concourses at the ground there is a diverse range of dining options including the likes of Dominos Pizza which is quite far for football fans to see, as well as expexcted classics such as pies, burgers and hot-dogs. In total Celtic operate three club shops throughout the city in addition to their very well-designed online super store. The stores are located at the terminal building in Glasgow Airport, the city centre (154 Argyle Street, G2 8BX) and at Celtic Park itself (See below for opening times). The exterior of the Celtic FC superstore located at the stadium. Guided tours of Celtic park are available to fans all week round from Monday to Sunday across four slots: 11.00 am, 12.00 pm, 1.45 pm and 2.30 pm. Matchdays tours are now available in the morning before kick-off between 9.30 – 11.00 am. For more information and to book your place on the tour you can either phone the club on +44 (0) 141 551 4308 or send an email to [email protected] It is strongly advisable that you book in advance as the tours are very popular. 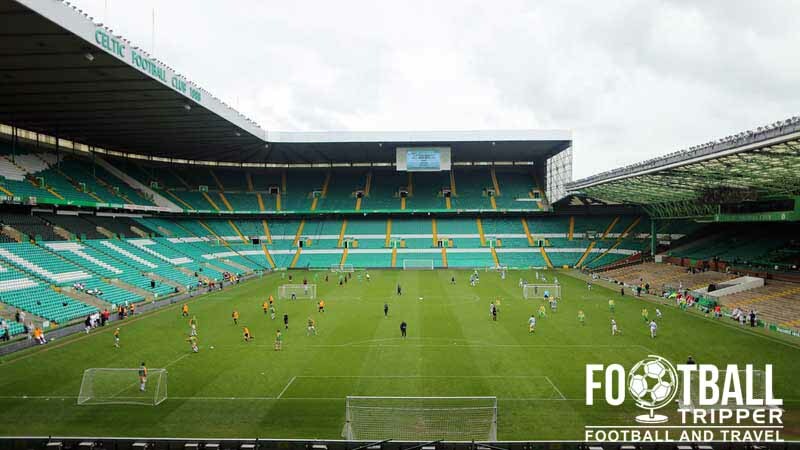 Tickets to see Celtic play at Parade can be purchased via the usual channels such as the 24 hour ticket hotline (0871 226 1888), in person from the Celtic Ticket Office in the weeks leading up to the match and online from Celtic’s E-ticketing page. The prices below represents the starting prices for the cheapest tickets within Celtic Park, and are subject to change depending on where you sit as well as who the opposition is . Celtic Park is located within the area of Parkhead approximately 2.2 miles east of Glasgow City Centre. As a result of the nearby area it is sometimes referred to as simply “Parkhead” by supporters. The exterior of Celtic Park Stadium. Glasgow Central is the main railway station of the city, and is for many visitors across both Scotland and the United Kingdom the de facto portal into the city. However when it comes to travelling to Celtic Park there are a number of train services one could realistically catch to the ground. The two closest train stations to Celtic Park are either Bridgeton and Dalmarnock which are both located five minutes from the stadium. Both are located on the same line, and are roughly the same walking distance so there’s not really any advantage to catching either on the way there. Services to either station can be caught from both Glasgow Central and the adjacent Argyle Street Stations. If you are travelling from Glasgow Queen Street Station you can catch a service to Bellgrove which is located approximately 20 minutes away north-west of the stadium on the other side of The Forge Retail Park and Crownpoint Sports Complex. This isn’t recommended however, as Argyle street and Glasgow central are less than 5 minutes away by foot. London Road (A74) – Running south of the ground, this can take you right outside the ground leaving you with a walking time of about 1-2 minutes. Parkhead Forge Shopping Centre – Located north of the stadium on Gallowgate A89 this is served by 61, 62, 64, 240 and 255, and shares the same walking route as if you were coming from Bellgrove. Approximately 15 minutes by foot. 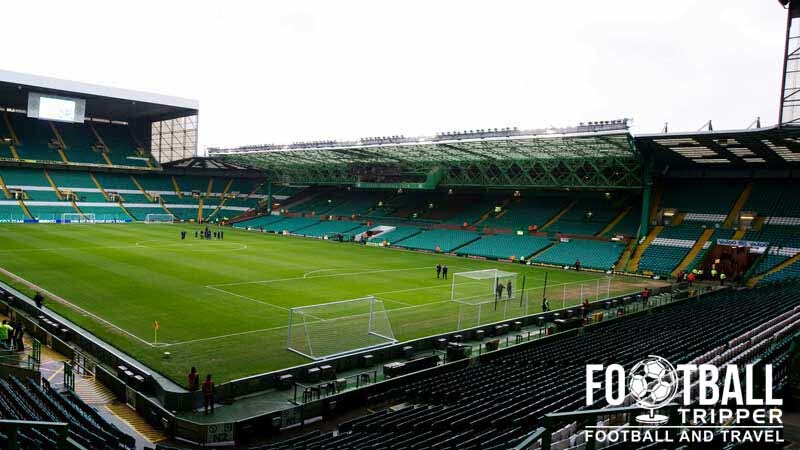 “Welcome to paradise” – The nickname some fans refer to Celtic Park by. 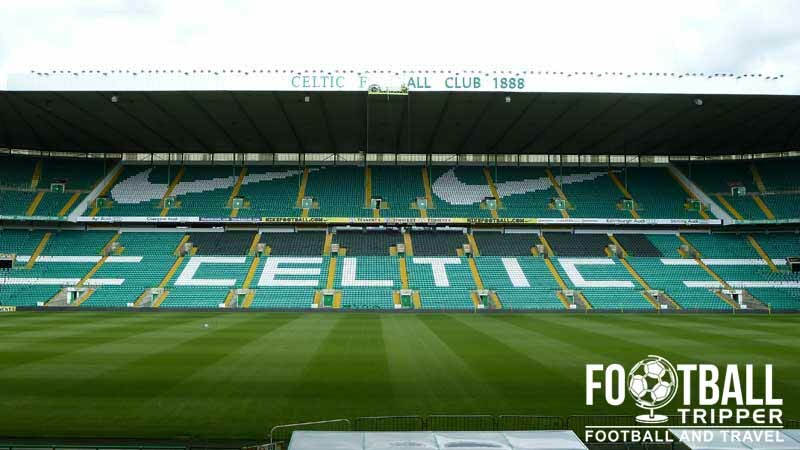 Celtic F.C currently have no provision for matchday parking at the stadium which means fans are either advised to park within the city centre or to use public transport. In Glasgow City centre there are plenty of choices to suit all budgets. The Holiday Inn next to the River Clyde is a reasonable enough choice as is the Premier Inn next to the main train station.